Oooh I have everything I need to make these in my fridge right now, and they look fantastic! I reeeeally hope this kid is a good eater. I was never very picky and my husband and I eat a ton of vegetables, so hopefully she'll take after us! These look sooo good. I love anything with goat cheese. Thanks for the recipe. This is a nice change from the traditional stuffed mushrooms! These look incredible. I mean, how could they be bad with that ingredient list? p.s. Caroline's awesomeness is so due to your awesome genetics AND awesome parenting! These little guys sound amazing! Great recipe! Caroline *is* so awesome. I don't care how she got there! 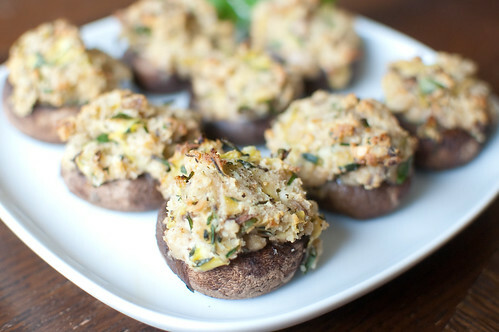 Stuffed mushrooms are seriously one of my favs! So easy & tasty... and you can pretty much stuff them with whatever you have in your fridge! My husband is a TERRIBLY picky eater. I look at his parents and so are they. I don't know if it's nature or nurture, but I'll tell ya, the apple doesn't fall from from the tree. My parents aren't picky, and neither am I. It'll be interesting to see how all parenting ideas/theories are disrupted by the 2nd (for myself included, we have 1 right now). 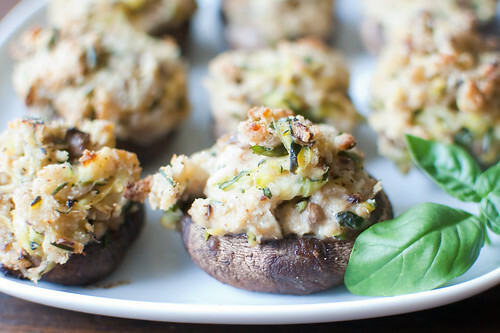 I'd eat the entire batch of zucchini and goat cheese mushrooms, YUM! What a great idea to use up the zucchini! These are beutiful and I love the goat cheese in here, such a great flavor. I have one picky eater and one great eater...my boys couldn't be more different. The picky one, it started at 8 months old when he would swat the spoon away as it came toward him in the highchair...good times.